I styled a casual outfit with a long vest to give my outfit a more fancy touch to it. I love the idea of casual + fancy combined in one outfit. My top is from ASOS with the appropriate “Fashion Blogger” on it. I love graphic tees and especially paired with the vest from Miss Selfridges. That was my main set this morning when picking out my outfit. 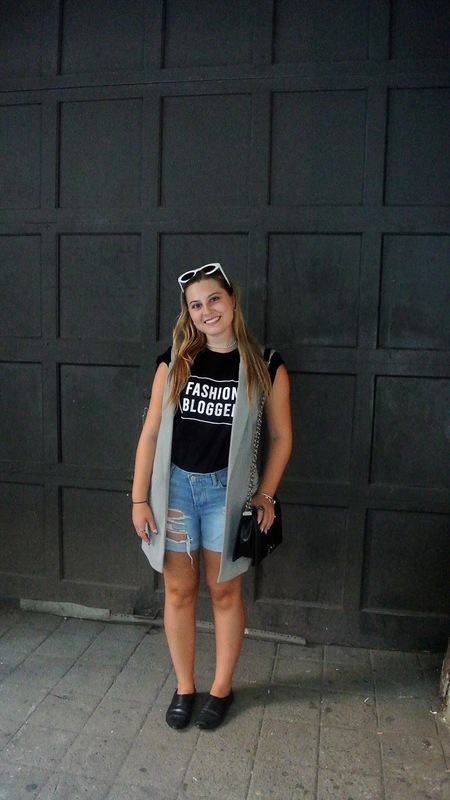 I chose these denim shorts from Urban Outfitters to add to the casual feeling of the outfit. I wanted the focus of the outfit to be on the top & vest so I went with basic bottoms. I’m wearing my Alice & Olivia flats that ties in with the sophistication with the outfit. I’m also using my new Chanel bag which I’m in loove with!